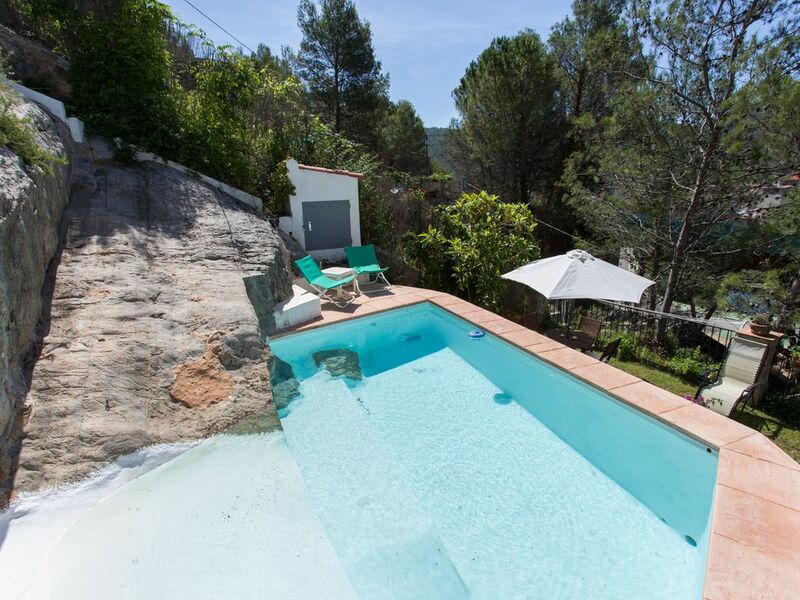 Beautiful cottage in Alcúdia de Veo, in the Natural Park of Espadan Mountain range. Surrounded by forests, springs and walking routes. Only 50 minutes from Castellón airport and less than 1 hour from Valencia airport by car. The nearest beach is only 38 kms from the town. The house has 2 double bedrooms and a large sofa bed in the living room. You will not go cold in winter or heat in summer, recently we have installed hot / cold air conditioning in the main room and in the kitchen-living room and has free wifi. The main room has a large double bed, an insuite bathroom and a large terrace with beautiful views of the woods and mountains. It is a very bright room with large windows. You will wake up watching the spectacular blue sky and the forests that surround the house. It has a terrace with a retractable awning where you can enjoy a delicious breakfast listening only to the birds. The second room has a double bed. It is a beautiful room, in front of it there is a nice bathroom with shower. The house is totally integrated into nature, it is a house that respects the environment. It is an old dryer built on a small hill. The house can only be accessed by walking, you have to park the car a few meters down. The house has two entrances, one by a small road a little steep, and the other, by a small staircase. The accesses are not suitable for people with reduced mobility. Número de licencia turística: ARCS-751. The town of Alcudia de Veo is beautiful and very small, only has 214 inhabitants. It has a small supermarket, a medical center and a large municipal swimming pool with restaurant where you can order a delicious Valencian paella or a barbecue. The municipal term has a chain of mountains, in the limit with the terms of Aín and Algimia de Almonacid, by height stand out the Height of the Pastora and the Pico Espadán (1041 m) that gives name to our mountain range. The vegetation that covers this mountain is protected as Microreserva de Flora. There are large areas of forest with cork oaks, pines, oaks and some chestnut trees. In a nearby village, Benitandús (18 inhabitants) there is a small reservoir that holds the waters of the Veo River and an impressive geological site, The Benitandús Organs. Also our municipal area is rich in fountains, the one next to our house is the fountain of San Pedro surrounded by poplars, a playground and recreational area to make paellas and barbecues. There is also the fountain of Jinquer, Canaleta, Zurrón, Ullastre, Rodenal, etc. In the course of the river Veo, we can find remains of several hydraulic mills, laundries, etc. There are also several caves, La Cueva de la Chelva, with a vertical opening in the rock of the mountain where there is a great flow of water, which when washed by other rocks to the bed of the ravine forms pools of water. Inside, a natural grotto forms, but it is difficult to enter. Other caves are: Sima de l'Alt, d'Eulogio, Cueva del Toro (speleology), La Hoya Vieja, La Lloma and Molinet. -GR-36 Route: Eslida - Alcudia de Veo: 2nd stage: 13'4 km. -Walk and trail to Jinquer. -Ruta Olivos: The route of the olive trees in Alcudia runs basically by the games "Olivares" and "Peña Negra", and by the districts of Veo and Benitandús. -San Antonio. They are normally held the weekend before San Antón in the district of Veo, performing shows of bulls and procession of animals, distributing the scroll and the lighting of a bonfire. -Fiesta de San Pedro Mártir. Pattern of the town. It is celebrated on April 29. There is a pilgrimage to the source of Santo where rolls are distributed to all attendees. -Fiestas del Cristo de la Salud. It is celebrated on April 30. Highlights the procession of the "axes" where many faithful come to fulfill their "promises" for the healing of some disease. -Fiesta de la Virgen de los Desamparados. It is celebrated on the second Sunday of May in the hamlet of Benitandús. People from neighboring villages come to celebrate the party and taste a good paella. -Fiestas of the Virgen del Rosario and San Francisco Javier. Summer parties. During the second week of August. Número de registro turístico ARCS-751.